I took the summer off writing ecology articles to attempt completely destroy the planet by travelling around the place like some kind backpack wearing horseman of the avocadolypse, moving from city to city like some sort of plague of annoyance on the locals while collecting varying degrees of sunburn. I mostly did it so I could use this wonderful cultural portal to boast about my holidays under a thin veil of ‘ecology’ or something, but you’ll be glad to hear, It went awfully, though I’m pretty sure the flights alone did enough damage to warrant the trip. Which raises the question; where does a person get on and off with the environment? I’m happy enough to say I’m a contradiction in progress when it comes to that nagging issue of making the planet unliveable. I think maybe only the most extreme personalities would be anything but that. I know my car is spewing unbreathable dinosaur shite into the air every day, I know that in order to make a phone call in a mobile location a child has to go down a cobalt mine, a load of concrete has to be poured into the earth, someone in a polo neck must receive money, steel must be heated to an exceptionally high temperature, reformed into a rigid structure using wizardry and transported to some scenic hillside where it takes the form of a mast, from which a combination of electricity and modern sorcery makes animated gifs of cats float through your fleshy form if it happens to be in the way in an instant so it can be reconstituted right into my face. Lol. I know this, yet I continue to use these things. And why would I? As Galway’s highest paid ecology writer surely I can afford some innately condescending lifestyle where the need for cars, mobile phones and any possessions not based on avocado or coconut oil are mere privileges while those faceless corporations take everybody else for a ride, and indeed, get paid in a currency so pretentious that the Eurozone is secretly stockpiling avocados and coconut oil to try and buy their way into it, but no, ecology writing pays in a very similar way that most people’s contributions to the internet do, and I, like you, must make do with the means of transport and communication available at my time of existence. However, contradiction or victim of circumstance, I started writing these pieces as a way of teaching myself more about exactly what I’m destroying on a day to day basis. Which brings me in no convenient way to looking at the absolute state of the way we’ve been doing things in Ireland. I’m reminded of the most wonderful and saddening scene narrated by the very reverend Boaty mcBoatface himself, David Attenborough. In this clip, David draws attention to the Lyrebird, a most wonderful creature – which with the most amazing accuracy can mimic the sounds in its local environs. The Australian national archive holds recordings of these birds’ mimicking computer games, flute players and speech. In the Attenborough clip, the bird is record mimicking the sound of chainsaws, which very obviously are approaching its habitat. In its innocence and desire to make itself known to its potential mating partners, it sings like this a for a few hours every day – essentially singing ‘hey babes I can make chainsaw sounds would you like to join me for dinner’ Lol. Stupid bird can’t even tell when a chainsaw wielding capitalist is about to turn its neighbourhood into a magnificent set of flat pack shelves with matching corner unit for the January sales. This very weekend, a project which has been running for a number of years is having its lyrebird moment. 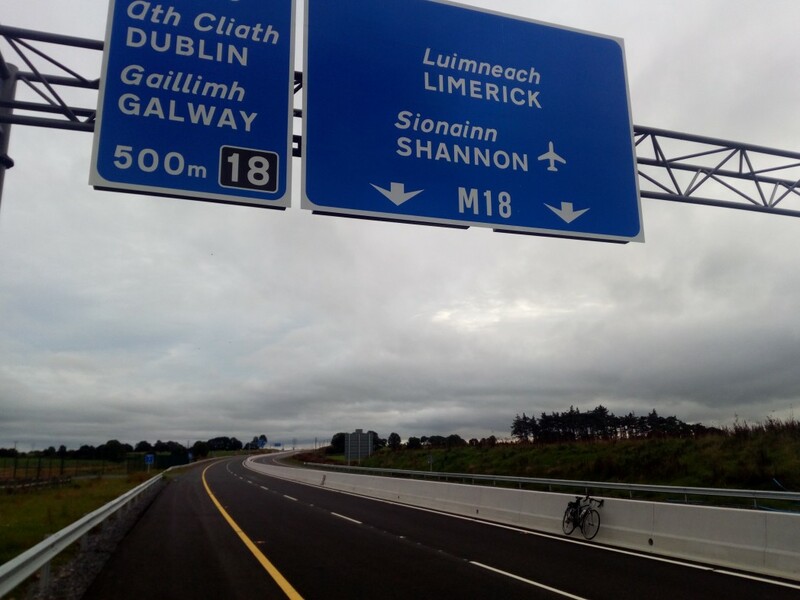 The Gort – Tuam motorway, for a day will open up for a charity cycle in which we can all for one time only cycle on this 550million euro piece of infrastructure. This will be the once in a lifetime that you, as a human being resident in Ireland not employed in the motorway maintenance trade or public services will be allowed to stand on this piece of land for a considerable amount of time. From then onward, not even the fastest human, Mr Usain Bolt will be allowed to set foot on this piece of Ireland. No cyclist, no farmer, no walker, just cars and only the fast ones will exist in this space. For the sum of 550million euro we have rendered approximately 560 acres of west Ireland a no go area for human beings and at the weekend, we’ll all go down for a cycle to celebrate it. People will raise some money for charity, smiles will be photographed and everything will be class, then we shall chase the humans off with dinosaur burning horses of steel forever. It will also mark the day that the new motorway releases the least amount of carbon dioxide while being used a means of getting from one destination to another for quite some time. Sounds like a good weekend. Go progress. Motorways, as any politically minded vote seeking populism drone will tell you, are progress, and the region always needs progress, and any non-positive mention of ‘progress’ or ‘motorway’ will result in the banishing of people from polite society for an unspecified period of time. The road, at no time is likely to act like a giant dam, and will at no point cause massive flooding in the rural districts, for it is progress and progress has no negative* side effects. *Any regions effected by the non-existent side effects of the progress may receive visits from vote seeking drones at a later date, pending a local ‘natural’ disaster, election, or both. The great sadness of this ‘progress’ is the climate of events right here in the west in which it’s taking place. Half of this route is already serviced by a railway which functions at a fraction of the cost of a motorway and those given the most vocal positions in the media seem to be taking every opportunity to outline how using the train is anti-progress and all trains should be imprisoned without an option of release to ensure the safety of the motorway, for it is progress and progress must never be questioned or endangered. A bicycle scheme in Galway city, which users must pay for and is also funded by a combination of public and 3rd party private company funding can’t seem to be opened or moved forward while at the same time there was 550million euro from your tax euros available for the Tuam to Ennis motorway of progress. That’s a stark, if awfully constructed sentence. But in summation cheaper faster cleaner trains are evil and must be stopped. But the progress must continue. Ireland is heading in the direction of being fined 200 million for ignoring the Paris 2020 climate agreement at the end of the decade and it would be incredibly embarrassing to somehow have to connect that with any kind of reality so most of the vote seeking populism drones are very carefully never, ever mentioning that side of progress. It would be also incredibly embarrassing if that for hours every day, the motorway was almost empty as the price of using a car increases due to oil runnning out, paired with a number of oil centred wars that are completely and utterly beyond the diplomatic skills of the vote seeking populism drones in Ireland and we elect a whole new fleet of drones in order to get some worthwhile public transport to fill the gap. TLDR: cheaper faster cleaner trains are evil and must be stopped, we can’t use your money to pay for your bikes in your city that you paid already so keep buying soft drinks, we will be back looking for more of that money to pay the fines we’ve been publicly ignoring in about 3 years, here’s a motorway buy a car, hippie, but cycle on it first. While it is the eternal birth right of every person who has paid motor tax to spend at least an hour of their day either shouting at cyclists or wishing death to them social media, It did occur to me at one point, around 9 hours into a cycle across southern Spain, that nobody had sworn abuse at me from a passing car window all day. I began to think I must be cycling wrong, but no, after some checking I gathered that I was still a small piece of sentient flesh moving along a roadside. Why then no abuse? Because when Spain build roads, they build service roads alongside them, so cyclists, pedestrians, tractors and slower drivers can make their own pace without interrupting the progress. When the roads meet the town, there are marked cycle and wheelchair shared spaces leading right into the city centres. In fact it was pretty difficult to be an annoying cyclist because the road planners had completely ruined almost every valid opportunity to do so. The ‘Great Western Cycle’ will take place this weekend and for once in your lifetime you can safely and legally cycle on a public road built with your money in aid of charity for the last time. You’ll hear the birds sing on that stretch of Ireland for the last time and there won’t be much in the way of squashed badgers or foxes to avoid. The edge effect will dwindle the wildlife in the area over the coming years and the floods will happen on at least one side of those 57kms of stacked up stone, tar and concrete. And if we stick to our current development plan, there will be around 11000 acres of motorway when finished in 2035 in Ireland. Our driving addiction and blindness to all other ways of getting around will turn into our lyrebird song, as we get on our bikes and mimic the very thing that will make the west less and less liveable for the later days of this generation. Returning to the one remotely coherent question posed in this article, where do I get on or off with the environment; I’ll be skipping this charity cycle, I’m not sure the indignity of such a farce is within the reach of my own contradictions. I just want to mention I am just newbie to blogging and really loved your web page. Almost certainly I’m want to bookmark your site . You actually come with exceptional articles and reviews. Regards for sharing your blog.